Beef bacon. It’s not new. But if you’ve tried it before it seemed to be lacking in flavor or consistency. Now there’s Schmacon, Beef’s Answer to Bacon. I have tried it and I like it. 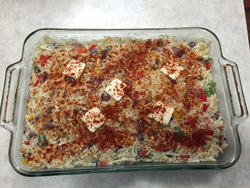 See my casserole recipe using Schmacon below. 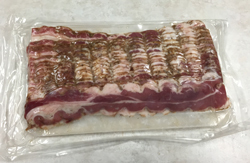 I recently interviewed the inventor of bacon, Howard Bender. I published the interview for my weekly podcast on AgWired.com. Howard has a Kickstarter campaign going to raise funds to develop his retail sales efforts. Support him here. Now let’s focus on the casserole. I think this will be an excellent addition to the Pig’s hunt days menu. Once the peppers, garlic and onions were tender I blended all of this in a bowl. I used about a cup of each cheese. On the spices I just shook enough in to “feel” that it was enough. Then I sprayed olive oil on a glass casserole dish, added some pats of butter, poured the mixture in, topped with pats of butter and paprika. Then baked it for about 45 minutes at 325. Boom. An explosion of flavor in your mouth. This casserole is good as a stand alone meal or for breakfast with eggs. Try some.